Celebrated annually during the second week of August, National Apple Week falls at the beginning of the autumn apple picking season, as orchards are just preparing for the flood of families looking to add apple picking to their yearly traditions and fresh apples to their snacking and dessert menus. While prime apple picking season may only last a few months, typically from late August to early November, the spirit of National Apple Week can continue long into the winter by properly storing freshly-picked apples. "Aside from the numerous health benefits of apples, which make them perfect for everything from healthy snacks to lighter desserts, apples are easy to store and preserve," said Beth Nielsen, Chief Culinary Officer of Nielsen-Massey Vanillas, Inc. "Winters can be long and harsh in many parts of the United States, and having fresh, delicious apples stored away can make those cold winter months that much more appealing. When you are ready to bake with your apples, add a teaspoon or two of Nielsen-Massey Vanilla to your recipe to round out the flavor and tone down the tartness of the fruit." Pairing your fresh apples with the smooth, rich flavors of vanilla is a timeless way to highlight America’s favorite fruit in a variety of baked goods. This year, during National Apple Week, use the first of your apple harvest in this recipe for French Apple-Almond Butter Cake with Vanilla Caramel Sauce, below, from Nielsen-Massey Vanillas. 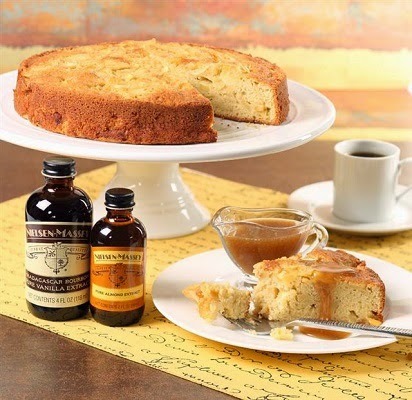 The sweet, mellow notes of Nielsen-Massey Madagascar Bourbon Pure Vanilla Extract and Pure Almond Extract balance with the tart flavor of Fuji apples to create a cake that is rich yet delicate and perfect for everything from entertaining to enjoying with an afternoon cup of coffee. ** Recipe and photo is courtesy of Beth Nielsen and Nielsen-Massey Vanillas. Recipe makes 8 servings. Directions: Preheat oven to 350°F. Lightly coat a 9-inch light color, non-stick cake pan with cooking spray; line the bottom of the cake pan with a piece of parchment paper; set aside. In a small bowl, add flour, baking powder, cinnamon and salt, whisk to combine; set aside. In a small saucepan, melt butter; set aside to cool. Peel, core and cut apples into ¼-inch pieces, place in a medium bowl and mix with brown sugar; set aside. In a large mixing bowl, add butter and sugar. Beat with an electric mixer on medium speed until combined, about 2 minutes. Scrape bowl sides with a rubber spatula as needed. Add eggs one at a time, beating after each addition. Add vanilla extract, apple liqueur and almond extract; beat to combine. Gradually add the dry ingredients beat on low, just until incorporated. With a rubber spatula, fold in 2 cups of prepared apple pieces into batter; pour batter into baking pan and evenly spread. Place remaining cup of apple pieces over top of cake batter. Bake until done, about 35-40 minutes. Remove cake from oven and run a knife around sides of cake. Let stand for 10 minutes and turn onto a wire rack; remove parchment and turn onto second wire rack to cool. Serve with warm Vanilla Carmel Sauce. Directions: In a small saucepan over medium heat, add butter, sugar, brown sugar and cream; cook and whisk. Bring sauce to boil. Remove from heat add vanilla extract and apple liqueur; stir until combined. Serve 1 tablespoon warm sauce over each slice of cake. To Print Recipe: Click on the share button located at the bottom of this post. A new window will open. Click on PRINT and the recipe will load into the window for printing. Enjoy!! !